Is stock market trading good for society? Short-term stock traders — such as hedge funds — have come under fire for pursuing their own profits rather than the long-run health of companies they invest in. The recent financial crisis added fuel to flames, but they had started burning several decades earlier. In the 1980s, many commentators argued that Japan’s economic success resulted from shareholders taking long-term stakes and thus having incentives to improve their firms’ long-run health. They thus pushed the government to take actions to reduce the stock market’s “liquidity” — the ease with which investors can trade their shares. These calls have resurfaced in the recent crisis, through calls for transactions taxes and short-sales restrictions to dissuade “excessive” trading. The traditional view is that liquidity undermines a firm’s corporate governance. Under this view, blockholders (large shareholders) can improve governance through engaging in direct intervention, otherwise known as “voice” — for example, removing an underperforming manager or blocking a misguided acquisition. But intervention is costly. Thus, blockholders may choose to simply sell their shares and walk away from a troubled firm. Liquidity makes selling easier, and thus discourages blockholders from sticking around and improving the firm’s long-run health. But it is far from clear that liquidity is detrimental to governance — and thus to society. Indeed, Japan’s “lost decade” of the 1990s raised doubts about the low-liquidity model. 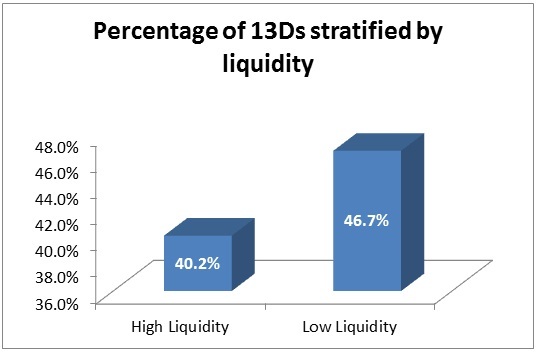 The theoretical literature has identified two major benefits of liquidity. First, liquidity makes it easier for shareholders to acquire a block to begin with (Kyle and Vila (1991), Kahn and Winton (1998), Maug (1998)). By encouraging large shareholders to form, it facilitates voice. Second, Admati and Pfleiderer (2009), Edmans (2009), and Edmans and Manso (2011) show that the act of selling one’s shares (engaging in “exit”), far from being the antithesis of governance, can be a governance mechanism in itself. Such sales drive down the stock price, which hurts the manager because his pay depends on the stock price. The threat of exit induces him to maximize value in the first place. With theoretical arguments for the desirability of liquidity being on both sides, it is ultimately an empirical question. Thus, it is to the data to which we turn. We analyze how liquidity affects both the decision to acquire a block and the choice of governance mechanism (exit or voice) once the block has been acquired. We study a particular type of blockholder — activist hedge funds — because they are unconstrained by legal restrictions and thus have both voice and exit at their disposal. Overall, we uncover a positive effect of liquidity on governance. 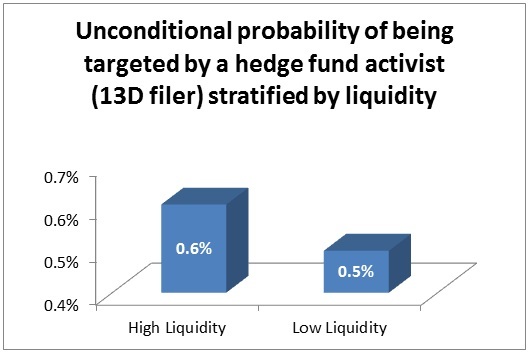 First, liquidity increases the likelihood that an activist hedge fund acquires a block (a stake of at least 5%) in a firm. To address concerns that there could be reverse causality (governance causes liquidity, rather than liquidity causing governance), or omitted variables driving both governance and liquidity, we use the decimalization of the US stock exchanges in 2001 as a natural experiment. This event led to a sudden increase in liquidity that was not caused by changes in governance. 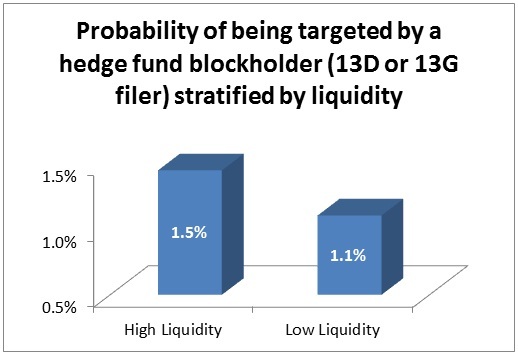 Second, liquidity reduces the likelihood that the hedge fund files a Schedule 13D (which conveys an activist intent) upon block acquisition, and correspondingly increases the likelihood that it files a Schedule 13G (which conveys a passive intent). This finding is consistent with the traditional view that liquidity weakens governance as it discourages voice. However, it is also consistent with the “exit” view that liquidity merely causes a blockholder to adopt a different form of governance — exit rather than voice. Third, we find that a 13G finding indeed represents a governance mechanism. It leads to increases in both stock price and operating performance, particularly in liquid firms. These results support the “exit” view that the 13G filings, that are encouraged by liquidity, represent governance through exit rather than the abandonment of governance altogether (as argued by the traditional view). Our final finding concerns voice. Our first result, stated earlier, was that liquidity increases the likelihood of block acquisition, but our second result was that it decreases the likelihood of a 13D, conditional upon block acquisition. We find that the first effect outweighs the second. Thus, liquidity increases the unconditional incidence of voice. Coupled with its positive effect on exit, liquidity has an overall beneficial effect on governance. Our findings suggest that policymakers should not rush into regulations that inhibit trading. It is through trading that investors can acquire a large stake to begin with, and also punish an underperforming firm by selling their stake. More broadly, our recent paper contributes to a recent literature on the real effects of financial markets. The traditional view (e.g. Morck, Shleifer, and Vishny (1990)) is that financial markets are simply a side-show, that passively reflect a firm’s fundamentals — for example, a fall in the stock price reflects a deterioration in firm performance. This newer literature, surveyed by Bond, Edmans, and Goldstein (2012), shows that stock prices actively affect a firm’s fundamentals — a fall in the stock price exerts governance on the manager by worsening his compensation and reputation; the threat of such a fall induces the manager to exert effort. Thus, policymakers should take into account the effects of financial markets on real economic activity when designing regulations. Alex Edmans is an assistant professor of finance at The Wharton School, University of Pennsylvania, a Faculty Research Fellow of the National Bureau of Economic Research, and a Research Associate of the European Corporate Governance Institute. Vivian W. Fang is an assistant professor of accounting at the Carlson School of Management, University of Minnesota. Emanuel Zur is an assistant professor of accounting at the Zicklin School of Business, Baruch College. They are the authors of the paper “The Effect of Liquidity on Governance” in the new issue of The Review of Financial Studies, which is available to read for free for a limited time. The Review of Financial Studies is a major forum for the promotion and wide dissemination of significant new research in financial economics. As reflected by its broadly based editorial board, the Review balances theoretical and empirical contributions. The Review is sponsored by The Society for Financial Studies. Subscribe to only business and economics articles the OUPblog via email or RSS. Great post explaining the advantages of stock market trading and its effects on society. Thanks for sharing.